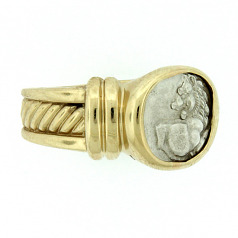 Ancient Greek Silver Hemidrachm Coin Ring Circa 440 - 350 B.C. Obverse: Forepart of growling lion looking back, paws raised. Reverse: Quadripartite incuse: Monogram, Symbols. Ruler: Greek-City States; Mint: Chersonesos; Country: Thrace. Framed in 14Kt yellow gold.